In this post, I will be showing you How To Spy on Someone's WhatsApp Chat Using an app called "Clone WhatsWeb ". 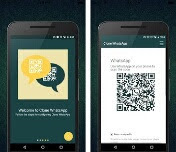 Clone WhatsWeb is an Android app that allows you spy on someone's whatsApp chat through your phone. If you want to closely monitor your child/ward's activities on WhatsApp, to keep tabs of your cheating spouse, or to investigate anyone at all on WhatsApp, through your own phone. I will show you how to use 'Clone WhatsWeb app' to spy and monitor people's activities. Note : For Educational Purpose Only . Just as the name implies, WhatsApp Clone is a hacked version of the original WhatsApp application but it makes use of the QR code to connect any WhatsApp account. This is similar to what the original WhatsApp web does. Once the QR code of a WhatsApp account is scanned, it will automatically authenticate and connect. Then you'll start receiving messages from that account in your phone, while the person will also be receiving messages and chatting normally without knowing. Clone WhatsWeb allows you run two WhatsApp on one device. » Internet connection on both devices. » Firstly Download CLONE WhatsWeb HERE , And Install. » You can enter a new password to secure your WhatsApp clone, go ahead and launch the app and you’ll see a QR code. » Then open the victims phone>from the chat screen>Navigate to menu> WhatsApp web. » Lastly, scan the QR code to the victims WhatsApp Web. » Once the code has been scanned, all his/her messages will be loaded on your own device automatically. You can now start monitoring and reading your victims messages. » You need to have access to your victim's WhatsApp Account to scan the QR code to activate it.